Third row (upward), l > r : Angela ?, ?, ?, Renata Darminia-Cassar, Nadia Sarda, Aurore Stein-Lascaris, Lilian Vella-Eynaud, ?, Nabila Taher, Paulette Hobeika. 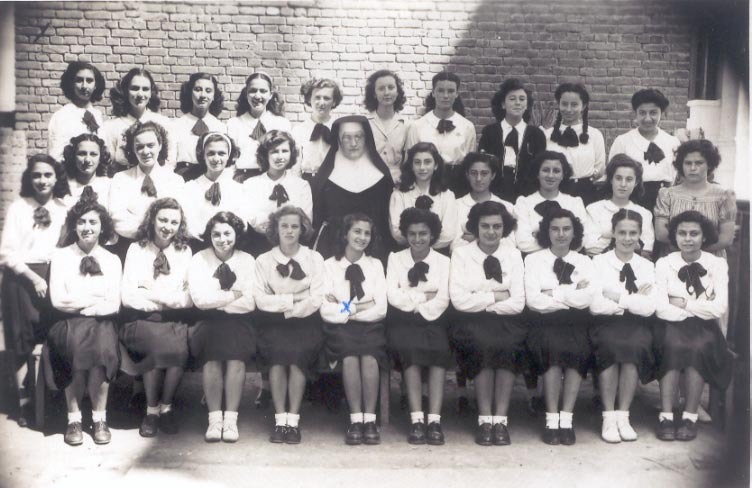 Second row, l > r : Claudette Boutros, Blanche ?, Jacqueline Lalouche, Helen (Nitzia) Petropouliades, Marcelle Charouich, Sister Lionella, Andrée ?, Yvonne ?, Jacqueline Sarkis, ?, Yvonne Sacco. Linda Stroun remembers Marcelle Avdala, Paule Aboulafia, Lily Helwany, Aurore Lascaris and Nabila Taher. Who are the other girls ? What are the addresses of the girls ?